In order to get a promotion loan officer Christine evicts an old woman from her home. But the client turns out to be Gipsy, and messing with her is a big mistake. Suddenly Christine finds herself in great danger. 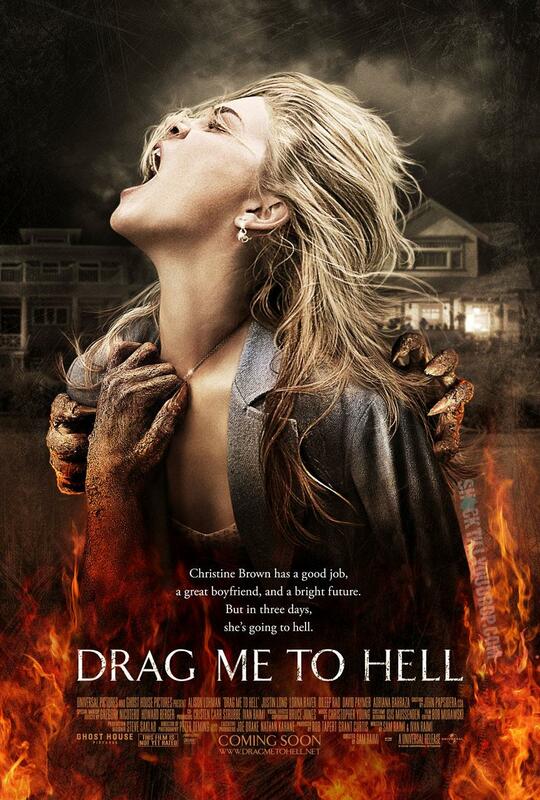 Drag Me To Hell is one of those movies that you either love or hate. It became one of my favorite horror movies of the past years, just because it is different. It could be a very well transformed Stephen King short story, because it reminds me a little bit of the movie Thinner (1996). It has disturbing images, but also comedic moments, that somewhat balance each other out. The movie was produced and directed by Sam Raimi, who is also responsible for The Evil Dead (1981) and the remake Evil Dead from earlier this year. But compared to Evil Dead (2013) Drag me To Hell doesn’t rely on solely gore effects, because it actually comes with a very interesting story. But it wouldn’t be a Raimi movie if it didn’t have a few over the top nasty gory moments. Justin Long is no stranger to the horror genre (known for Jeepeer Creepers, 2001) and plays his part well, and so does Alison Lohman. Everyone involved in this movie seems to love the horror genre and plays it off perfectly. The Ending, well… it comes as a surprise and you are left with a “Really? That’s it?” – feeling, however, Drag me To Hell is still a fun and bizarre ride that is worth every minute. A tip: Don’t get a PG-13 version; get the unrated director’s cut. Pingback: 31 Days of Halloween: Day 24: Frailty (2001) – A Dark and Disturbing Thriller | Simon Says... WATCH THIS!